Crutch pad distance from armpits: The crutch pads (tops of crutches) should be 1½” to 2″ (about two finger widths) below the armpits, with the shoulders relaxed. 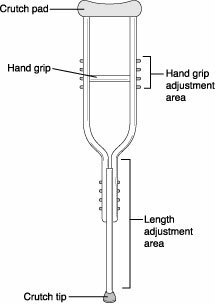 Crutch length (top to bottom): The total crutch length should equal the distance from your armpit to about 6″ in front of a shoe. 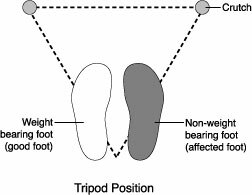 The tripod position is the position in which you stand when using crutches. It is also the position in which you begin walking. To get into the tripod position, place the crutch tips about 4″ to 6″ to the side and in front of each foot. Stand on your good foot (the one that is weightbearing).